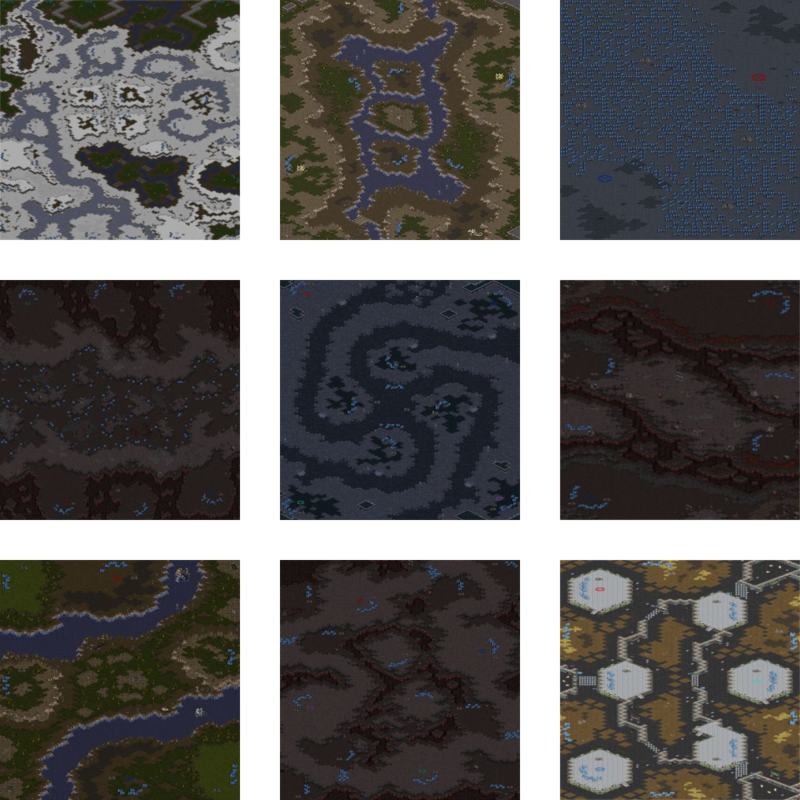 Do you remember a time when Starcraft was more about discovering stuff and playing fun maps? Do you remember a time when people did not cry for optimized maps and whine about balance on maps? Do you remember when each map was a challenge and required very specific builds? Do you remember when weird and unconventional maps, like island maps were a thing? I do and I miss that time. I had the lobby open for over an hour. Nobody wanted to have fun on a weird map. I felt sad, gloomy and dismal. This got me thinking, what if we had a FUN league with really weird maps? This started my search for the most bizarre and special maps I could find to host in this new league. Today, I present to you the abomination created by the vigorous, grueling map selection process that took too long to complete. Routa’s Weird Map League Season 1! The tournament will start on the 18th of February. The way it works is that I post pairings on the tournament Discord-channel and you meet with your opponents on discord. Once pairings are posted, you have until next Sunday 1PM (GMT +2) time to play your matches and post spoiler free replays in the Discord #replays channel. Next week's pairings will be posted approximately 2 hours after previous weeks cast is done on Sunday. THERE WILL BE NO SCHEDULED TIME TO PLAY YOUR MATCHES, EACH PLAYER WILL CONTACT THEIR OPPONENT ON DISCORD TO AGREE ON A TIME TO PLAY THEIR MATCHES. +2 points for the pimpest play of the week for each group. +1 point for the coolest build of the week for each group. +1 "at least you tried"-point for each group. Pairings and playing the matches in group stage #2 will work the same way it worked in group stage #1: pairings on Sunday, play matches and post replays before Sunday 1PM GMT+2. After group stage #2 (and possible tiebreakers if uneven amount of qualifying players) the top 8 players will be seeded into a double-elimination bracket which will decide the winner of the tournament. I will provide more information about bracket stage and groupstage #2 when I see how many players sign up for the tournament. The tournament will run for 5-8 weeks depending on the amount of signed up players. - Failing to play matches or post results within the provided time frame will result in a warning. If you get warned twice, you will be disqualified from the tournament. - All matches until bracket stages are BO3, one map will award you one point in the group. -Race picking is NOT allowed. When you sign up for the tournament, you must announce your race on the Discord. - If a player disconnects then it is an automatic loss for the person who disconnected. - The only time this isn't applicable is if BOTH players agree to a regame. All sign-ups must be done via the official RWML Discord, which can be found here https://discord.gg/T8aDQKd ! Sign up on the #sign-ups channel, please announce your race and wait for an admin to add you to #registered-players. Sign-ups will close 24 hours before first pairings will be posted. All games will be cast on my stream at https://twitch.tv/ikirouta on Sundays after each week, beginning at 1PM GMT+2 time. -What? A fun weird map league! -When? From the 18th of Feb onwards. -Can anybody sign up? -yes! -Where do I find the maps? On the discord #maps channel. Also I'd really like to play in the tourney myself, do you think it is ok for the tournament organizer to play in his own tournament? I'm the brave soldier entering this league w/ Zerg as my race. God speed, John Glenn. You should add Astral Balance too. It's not a team league though? Cool, Plasma is a fun map. I'd play but its just way too early into the day. Sunday 1PM GMT+2 is casting time. You play at any time you can agree on with your opponents within the provided 7 days. You have a week to play the matches and post the replays. Demon's Forest was in the final 11 maps I was considering, maybe for season 2...? "As reported earlier by WaxAngel, many pro teams have been complaining to OGN about the new Map Demon's Forest. As written here, the majority of complaints are about the tree doodads in the middle of the map. These doodads cause glitches in unit behaviors, specifically with vultures laying mines and archons being warped. (Although god knows how dragoons fair with their spastic behavior)." Edit: but if the tourney is for fun then it could be amusing watching players have to deal with this sort of stuff. That's why I made a fixed version of it ;D.
"As reported earlier by WaxAngel, many pro teams have been complaining to OGN about the new Map Demon's Forest. As written here, the majority of complaints are about the tree doodads in the middle of the map. These doodads cause glitches in unit behaviors, specifically with vultures laying mines and archons being warped. We know now what causes vortex bugs and have the tools to easily debug it. It's actually a far more common bug than most people might think, I'd estimate that at least 1 in 3 maps has at least one instance of it. Obnoxiously, Demon's Forest had dozens of instances because of all the unwalkable trees in the middle of pathfinding regions, though. (Although god knows how dragoons fair with their spastic behavior)." To glitch units into a vortex, you need collision box overlap first: worker drills, burrow stacks, Lurker morphs, Archon morphs or laying Mines are required to achieve it. Maps would be perfect if we had hall of valhalla. That was actually one of the maps I was considering too! I will be doing more seasons for sure if he we get enough players, so maybe season 2? Not nearly as crazy but what about Monty Hall?